SAN ANTONIO — Cleveland Cavaliers coach Tyronn Lue says the Cavs’ explosive team meeting before Monday’s practice needs to result in better play on the court or else it will amount to meaningless talk. “I don’t know if it was needed, but now we got to do something about it,” Lue said at Cleveland’s shootaround Tuesday morning in preparation for the San Antonio Spurs. “Do a lot of talking, but we got to play better. We got to execute better offensively. We got to execute better defensively. We got to be better collectively. With frustrations boiling over after Saturday’s 148-124 blowout loss to the Oklahoma City Thunder — a game in which Kevin Love played three minutes before subbing out and leaving the arena early because of an illness — Love and other members of the team were called out in a fiery exchange on Monday, as first reported by ESPN’s Adrian Wojnarowski. “Did I feel like a target? I think everybody, most people were a target,” Love said Tuesday when asked about the meeting. “We’re trying to figure this thing out. People hold themselves to a very high standard on this team, and we’re a team that feels like we can compete at the highest level. For us, it’s not about me. I’m not going to make it about myself. I’m sure with other guys it’s the same thing. Love told reporters Monday that he was feeling dizzy and disoriented before the Oklahoma City game. He and the training staff agreed to have him sit out and see whether his status improved by halftime. It didn’t. Once Tristan Thompson was pegged to start in Love’s place to begin the third quarter, he showered, changed and left the arena before the game was over. During the team meeting, players were both skeptical of Love’s sickness and critical of the Cavs’ coaching staff and decision-makers to allow him to leave the team like that without any accountability, sources told ESPN. Cleveland comes into the Spurs game having gone 3-9 since Christmas Day and having given up 118 points or more in five of the past seven games. Within the locker room, blame for the Cavaliers’ struggles has been directed toward everyone, from Love to Isaiah Thomas?to Lue to the front office, led by general manager Koby Altman, to owner Dan Gilbert, league sources told Wojnarowski. James’ play has also been called into question, according to multiple team sources. During the Cavs’ past 12 games, he is averaging 22.5 points, 6.8 rebounds, 7.1 assists and 4.4 turnovers while shooting 20 percent on 3-pointers and 65.8 percent from the foul line. James repeatedly refused to address the team meeting when asked about it on Tuesday. On Monday, James commented on his recent play. Midseason struggles and the drama that surrounds them are nothing new for this Cavs team. Each of the past three regular seasons included spotty play that, contrasted with championship expectations, created tension. And each of the past three regular seasons were followed by NBA Finals berths as the league’s Eastern Conference champion. James was asked whether the Cavs thrive on chaos at this point. While the Cavs’ discord has gone public, there is a sentiment within the team that their emotional moment are not that different from what any team experiences throughout the course of a season, sources said. “All families fight,” one team source present for the impromptu meeting told ESPN. 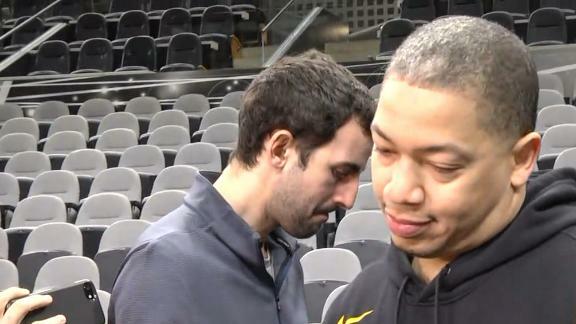 Lue, who sat out a game on Dec. 21 because of an illness and had to miss most of Monday’s practice for a doctor’s appointment, said Love should be taken at his word. Lue also said it’s hypocritical for players to blame Love when they let the Thunder score 148 points — tying a Cavs franchise record for most points allowed in a regulation game — and weren’t competitive for most of the game. Several team sources told ESPN they hope that communication will improve in the organization from top to bottom — from players talking on defense to Altman, in his first year as GM, establishing protocol for open discourse. Altman continues to work on potential deals to improve the Cavs ahead of the Feb. 8 trade deadline, and the meeting did not affect his urgency in that regard, sources told ESPN. April 28, 2018 Comments Off on Kevin’s Week in Tech: Let’s Check In on the Other Social Networks, Shall We?